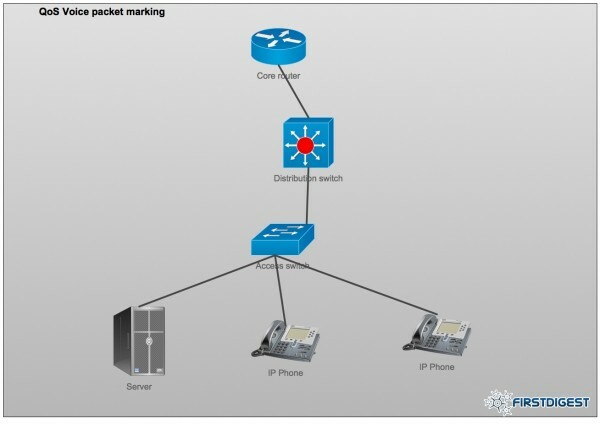 In one of my previous posts I was explaining how to mark packets closer to network edge. Starting from that point, we are sure the packets are market with the correct value, so on the router device we can directly match those packets and prioritize using Low Latency Queueing. I believe you already know why queueing is so important for Voice packet especially, but also for all other kind of real time protocol (e.g. Video over IP), but just a small reminder. Most of the interfaces are using FIFO method for queuing. This is the most basic queue method and as you probably know means First In First Out. In human terms, first packet how arrive on the interface will be send first. Nothing wrong with this theory until this point and I can assure you that most of the time you don’t have to do anything to improve this technique. But what if you have real time protocols (e.g. voip services) and data transfer over the same physical interface? With FIFO the packets are sent out the interface as they arrive, but this is not very good for the delay sensitive traffic like voice. If a TCP packet in HTTP flow can wait it’s turn to be sent out, with not visible impact for user, than a delayed voice packet will cause deprecation in voice call. With this problems need to be solved we arrive at LLQ, which is an ehanced version of Priority Queueing (PQ) in a Class-Based Weighted Fair Queueing (CBWFQ). I have to tell you that after the bandwidth or percent value you can add a burst value in bytes. If you don’t add this value, it will be calculated automatically. I chose this method when I’m doing simple config, but if you want to fine tune the values you can calculate it yourself and add it. Be careful that a higher value will influence the Tc value in the process. 3) Apply the policy to the WAN interface of the Core router (I assumed that the Core router is your direct connection to provider backbone) direction outbound. You cannot apply this type of queueing direction inbound. Keep this in mind. Low Latency Queueing feature not supported in input policy.